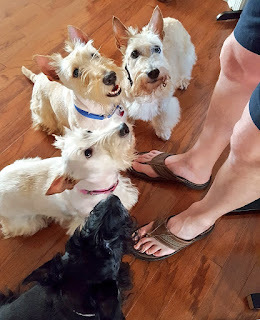 The Scottie Mom family doubled in size one week ago today with the additions of Nibbles and Pudley, two wheaten Scottish Terriers ages 5-6 years old from Scottish Terrier Rescue of Tennessee. To celebrate the one-week anniversary of being in their forever home, we surprised the Scottie quartet with a special meal by adding Natural Balance Delectable Delights® Wet Cups to their main course. Pudley chowed down on Woof'eroleTM, Mr. K had Fish 'N ChicksTM, Nibbles enjoyed Duck'en-itasTM and Heather savored Surf 'N TurfTM. Nibbles and Pudley, so fresh and clean after their first trip to the groomer, licked their bowls clean. Heather barely came up for air until her Natural Balance Delectable Delights® Surf 'N Turf TM dinner was gone. 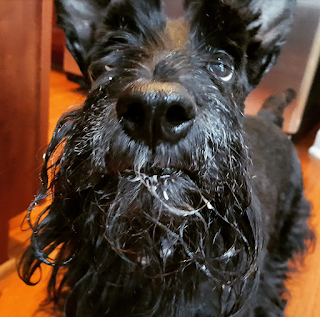 Mr. K pushed his bowl around the entire kitchen and finished his meal so fast, he didn't realize he left enough for dessert in his beard! 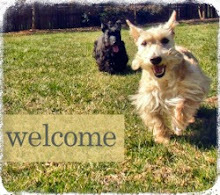 Time flies when you're having fun and welcoming two more rescue Scotties into your home. The Scottie House feels much more like a full house these days and we are loving every minute of it! Nibbles and Pudley have so much energy and share Mr. K's love of toys (note to self: stock up on squeaky tennis balls). They love to keep you company, smile constantly and are curious about everything...especially their new, older Scottie siblings. Heather and Mr. K already have adjusted to life with Nibbles and Pudley. I was prepared for some resistance at first but truth be told, they've accepted their younger siblings readily. 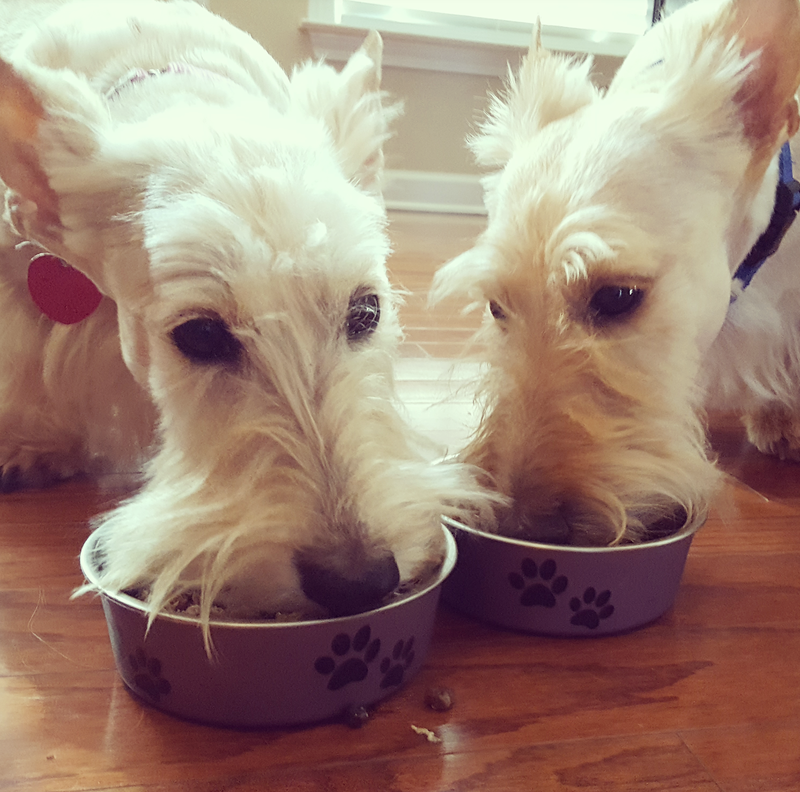 It is as if they remember what it was like to be a Scottie in need of a good home and want to give Nibbles and Pudley that same experience of feeling rest assured you'll be taken care of from this point forward. So, it is safe to say Nibbles and Pudley are here to stay (although I was sure of it when Nibbles hopped into the Scottie Mobile without invitation just minutes after meeting everyone). To celebrate, I wanted to whip up something special for the Scottie quartet to enjoy but sadly, I'm no use in the kitchen. And I wasn't interested in handing over any treats, mostly because I knew The Overtreater would be visiting the same day. That's when we discovered Natural Balance Delectable Delights® Wet Cups, which are cooked to perfection and can be added to their regular food to spice things up or given as a meal on the go. 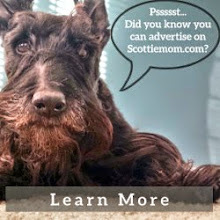 Great for the Scottie Mom (or Dad!) that can't cook. Ready to try some? 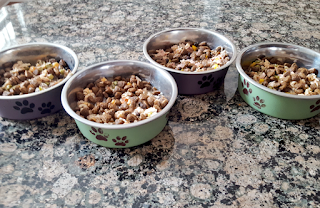 This Scottie Mom is pretty choosy when it comes to what I feed my dogs. For years, I've had Mr. K on a limited ingredient diet because of allergies. Heather, on the other hand, eats anything but we'll soon explore food items that will help keep those liver values in check. 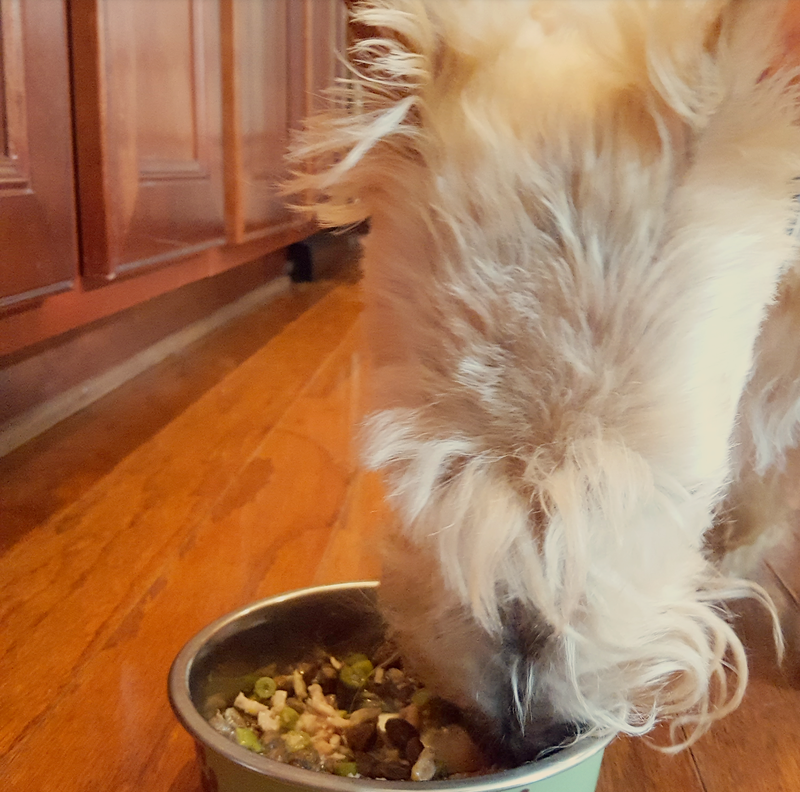 Now with Nibbles and Pudley, who also seem to have allergies, it is even more important to stick to grain-free, wholesome ingredients. 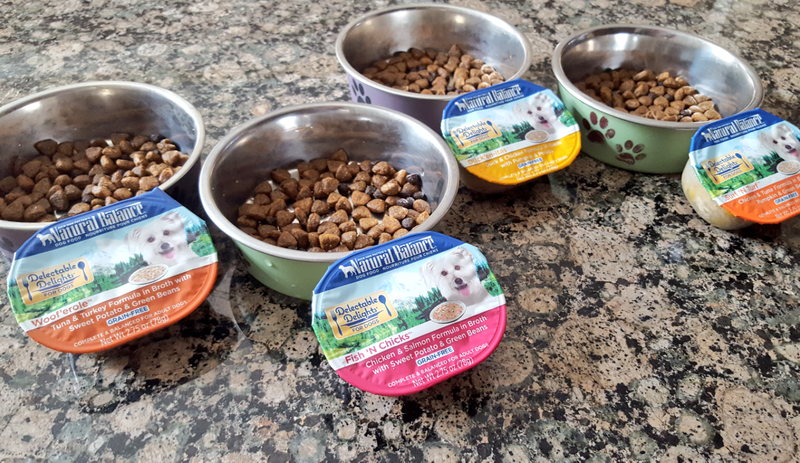 All requirements met by Natural Balance Delectable Delights® Wet Cups. 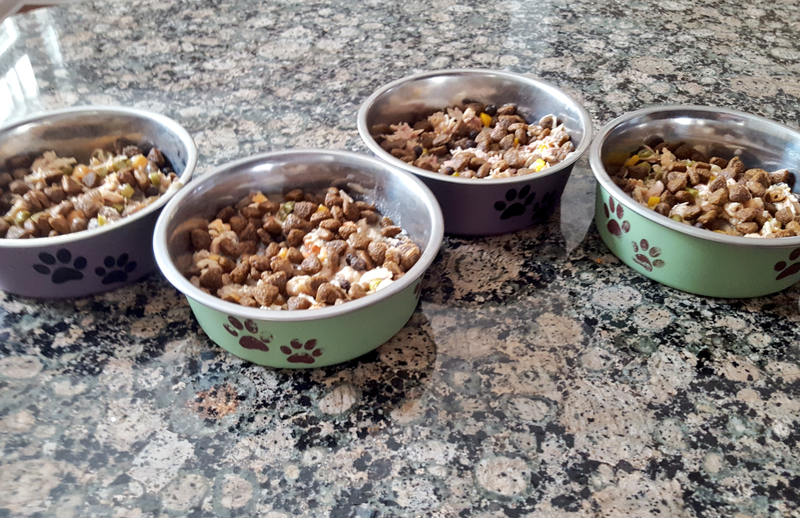 With four flavors from which to choose, we were able to give Heather, Mr. K, Nibbles and Pudley their own custom dishes. Something tells me we'll be surprising them with Natural Balance Delectable Delights® Wet Cups again soon and switching up the flavors to see which they love most. (Who likes eating the same thing every day anyway?) To learn more, visit Natural Balance Delectable Delights® Wet Cups on Facebook or check out Instagram to take in all the cuteness happening there. Many thanks to Natural Balance for sponsoring today's story and inspiring me to try their product! You have to change your blog from "Scottiemom" to "Scottiemob". Ha Ha! I love the dessert left in the beard! Gorgeous pups! We're so happy they've found a home with you! There's no such thing as too many scotties! We also eat everything. You had a beautifUl family and now your family is even more beautiful. CONGRATULATIONS!